When the US began to rearm just prior to WWII, they found the only medium to heavy caliber antiaircraft guns they possessed were leftover 3" (e.g 75mm) ones from World War I. While relatively powerful for their time they were seen as obsolete for the new aircraft then coming into service. While the guns were soon adapted as antitank guns and served in both towed and self-propelled mounts, they were to be replaced by a newly designed 90mm weapon that entered development in 1938. The 90mm Gun T2 and 90mm Mount T1 were approved for service as the 90mm Gun M1 in March 1940, and soon entered production. While it weighed 19,000 pounds (8626 kilograms) it traveled on a single axle four-wheel carriage that unclipped for emplacement. Four folding platforms expanded to create an octagonal work area for the gunners and loaders, and it provided an improved altitude capability of nearly 40,000 feet when working as an AA gun. The later M1A1 added a spring-assisted rammer. But production was slow, and due to the way the war unfolded the US Army did not need the heavy antiaircraft protection that the Germans found necessary. While the 90mm was more than capable of dealing with tanks – and did so as part of the armament of the M36 tank destroyer and M26 tank in a modified form – they were rarely used as ground defense weapons and thus never garnered the mystique of the German “88". Some were used as auxiliary artillery weapons and fired HE rounds for ground support. By the end of the war just over 7,800 90mm AA guns (including the improved M2 model with true dual capability and a twin-axle carriage similar to the 40mm Bofors) had been built. Some 90mm guns served in Korea, but as with their service in WWII due to US air superiority had little to do. A couple of years ago Hobby Boss released two kits of the popular M4 18-Ton High Speed Tractor, the Type A version for 3" and 90mm Antiaircraft Guns and the Type B for the 155mm/8"/240mm guns. 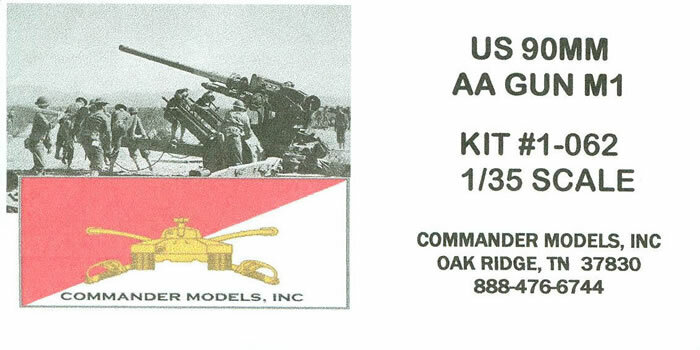 While the latter sold very well (as it could couple up with the very nice AFV Club 155mm and 8" howitzer kits) the former was something of a drug on the market, and at one point Squadron Shop was offering them at half price to get rid of them. This was simply due to the fact there was nothing for them to “do” as there were no guns for the tractors. Commander Models has now risen to the cause and provided a nicely executed kit of the M1 version of the 90mm gun in resin. Consisting of 70 parts in grey resin and no etched brass, it provides for a model of the gun that can be either modeled in travel mode on its carriage or deployed for combat with its platforms down and gun elevated. It comes with the proper “street” tires on the axle bogie and a much improved set of directions over past Commander Models kits. Parts in this kit were “full” shots and no problems were noted with air bubbles or any “short” parts. The four platform sections only had a minor bit of flashing in the perforations in their decking and are easily cleaned up. Assembly begins with the gun barrel and breech and the “horsecollar” recoil slide assembly. These go in the upper carriage cradle that eventually snaps into the lower carriage. Seats and controls attach to the lower carriage during assembly. The base does not permit loose fitting of the bogie carrier and towing tongue to it so the modeler will have to decide on firing or towing early on; as noted earlier the gun was not designed for dual purpose use, and thus cannot be set up and fired from its transport position. Each outrigger comes in two sections (there are three). The wheel bogie has to be either fixed in the down position for transport or the up position once removed from the carriage (the counterpoise suspension pistons, parts 10/11 and 34, must be assembled accordingly as either retracted or extended as a result). Also the platform sections must be attached to the tongue of the bogie carrier in transport mode or snapped into position on the lower carriage for deployment. No finishing directions are provided (the guns were OD overall with bare metal recoil slides and the only markings on the example shown were a warning of DANGER POWER BRAKES on the top of the rear outrigger when folded). No ammunition is provided, but any set with rounds for either an M36 or later US tanks with the 90mm gun is appropriate. Overall, this is a significant artillery piece even if it never became as famous as its German counterpart. Now the problem is finding one of the Hobby Boss Type A tractors from a dealer!